Newry, Mourne and Down District Council are inviting applications for street trading at Hill Street, Newry on St Patrick’s Day, Sunday 17 March 2019. Applications for a Temporary Street Trading Licence will only be accepted from Friday 1 February 2019, 9.00am. Closing date for receipt of completed applications is Friday 15 February 2019, 4.00pm. Incomplete applications will not be accepted. Street Trading Licences will be granted based upon the ‘criteria for the award of street trading licences’. Please note there is a limited number of trading spaces available. Please note the application fee is non-refundable regardless of whether your application for a Temporary Street Trading Licence is successful or not. 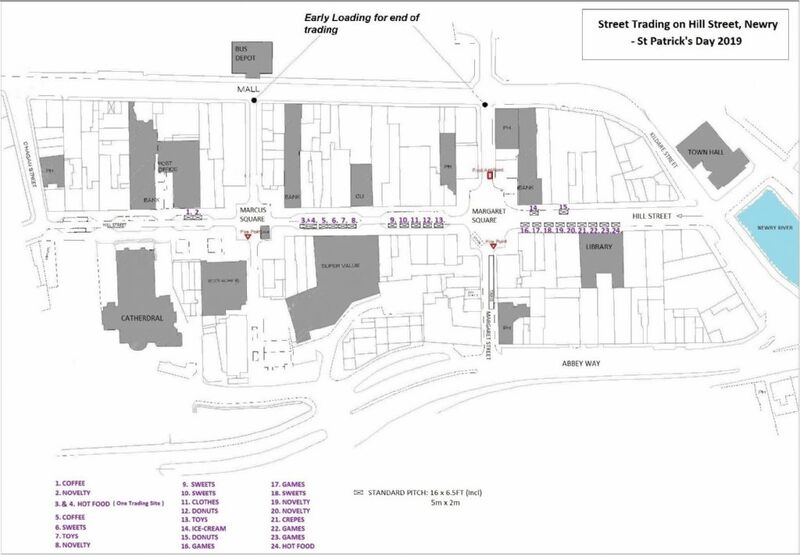 A Temporary Street Trading Application Form is available to download below. The completed application form and relevant documentation should be returned to Newry, Mourne and Down District Council, Licensing Section, Enterprise Regeneration and Tourism Department, O’Hagan House, Monaghan Row, Newry, BT35 8DJ with a cheque or postal order, for the appropriate application fee, this should be made payable to ‘Newry, Mourne and Down District Council’.